Connor O’Malley is an experienced wilderness skills educator. He was an instructor at Alderleaf for several years and wrote articles for the Alderleaf website. 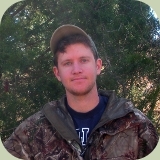 Connor holds a Bachelor of Science in Natural Resources Management and Rangeland Ecology from Colorado State University. He has been passionately exploring nature and studying primitive skills since growing up in Texas. After graduating from university, Connor traveled across the country working for and learning from various wilderness schools. He has also worked as a professional tracker & biologist, including a field technician position with Panthera's Teton Cougar Project. He spent the summer of 2012 participating in a stone age project where he and twelve others lived for a month using only primitive tools, clothing, and wild food to survive. Connor is certified as a Track & Sign Specialist through CyberTracker, is a Wilderness First Responder, and has published articles in the Bulletin of Primitive Technology and Backwoodsman Magazine. When he’s not looking for bears, Connor is probably flint-knapping, playing guitar, or dreaming about a new primitive pursuit.